The Lake Erie Boatanchor group is a bunch of ham radio enthusiasts that have a huge appreciation for old ham radio equipment. There is no organization and no membership. The meetings that we have are NOT hamfests! I wish to emphasize that. The meeting is a place to see friends and bring any old ham radio equipment that you wish to see passed on for use by someone else. All equipment exchanged at our meetings is done without regard to what the equipment may be worth on an internet auction site. We simply expect that you will personally use any equipment that you acquire at our meetings. Reselling any of this equipment and profiting from our generosity is strongly frowned upon and asking Ebay prices for equipment that you bring will not be welcomed. Dale R. Bowen, 75, of Southington, passed away Sunday, July 1, 2018, at St. Joseph Health Center in Warren. He was a 1961 graduate of Lincoln High School in Ellwood City and earned his degree in electrical engineering from Penn State University. Dale retired from Peerless-Winsmith in Warren, where he was Chief Electrical Engineer. During his career, he developed the motor for the Navy rescue submarine and components for the F-16 fighter jet and GE locomotive. 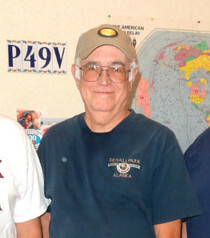 He was an avid amateur radio operator, with the call sign W8SHR. He participated in the meetings of the Boat Anchor Amateur Radio Group. Mark, AC8CL sent me some pictures of his military communications van. His van was used with these radio's at this years (2017) field day site. The meeting today was exceptional! It was cold and wet outside but inside there was food, friends and plenty of equipment that needed "repurposing". It was a feeding frenzy of all sorts. Bill K8DBN met up with Bob W8NNC ... unusual because they haven't seen each other in 58 years! Ken brought transformers, meters and variable caps from John W8TPH that found homes and uses in shacks all over this area. Mike N8ECR from the DX60 net was there representing Michigan and had the distinction of travelling the farthest for todays meeting. It was good seeing Mike there! Buddly WD8BIL "Bud in Stow" was there too! Below are a couple of pictures from today and at the bottom click on the link to an album of all of the pictures that I took today. You find good old boatanchor gear and lots of smiling faces, some you may recognize! The guy that puts it all together! Web site by Larry W8ER Copyright leboatanchors.com 2017. Travel theme. Powered by Blogger.